Problems with your sewer system are amongst the most costly, time-consuming, and frustrating situations that property owners in Norman, Oklahoma must deal with. Unfortunately, they are inevitable, especially if your home, place of business, or investment real estate was built over forty years ago. In the past, sewer pipes were manufactured out of materials that are inferior when compared to the heavy-duty plastic PVC that is used in this day and age. For example, cast iron was the sewer pipe material of choice at one point. Although it is a super strong metal, cast iron rusts when exposed to water. Over time the rust spots give way to rot, and the rotted spots corrode the pipe. Sewer pipe manufacturers eventually replaced cast iron with clay tile pipes. Although clay holds up well when exposed to water, the vibrations and shifts in the earth cause the material to chip and crack. Over time these small cracks turn into larger ones. It certainly does not take long from that point for the entire sewer pipeline to break into pieces. When cast iron and clay tile sewer pipes are compromised tree roots begin to invade the pipeline. The raw sewage and wastewater fertilize the tree roots and they begin to grow as quick as weeds. The tangle of tree roots causes blockages or clogs in the sewer pipes that act as dams. When the raw sewage and wastewater cannot reach the city’s main sewer line or the septic tank it tends to leak directly into the ground. You will notice foul-smelling puddles forming in various spots around the exterior of the property. In a worst-case scenario, the raw sewage and wastewater will back up into the sewer pipeline and enter into the property through the toilets, drains, and water faucets. When this happens, people tend to panic. They may even hire the first plumbing contractor that responds regardless of the price or repair method the company employs. Hitting the panic button can lead to a costly mistake. It is certainly better to be prepared ahead of time. Thanks to modern technology you are not stuck using a plumbing contractor that relies on the traditional excavation method. There is absolutely zero need to have your landscaping and hardscaping ruined by a large and destructive trench. Forward-thinking plumbing contractors incorporate the use of the Nu Drain trenchless sewer pipe lining method instead. 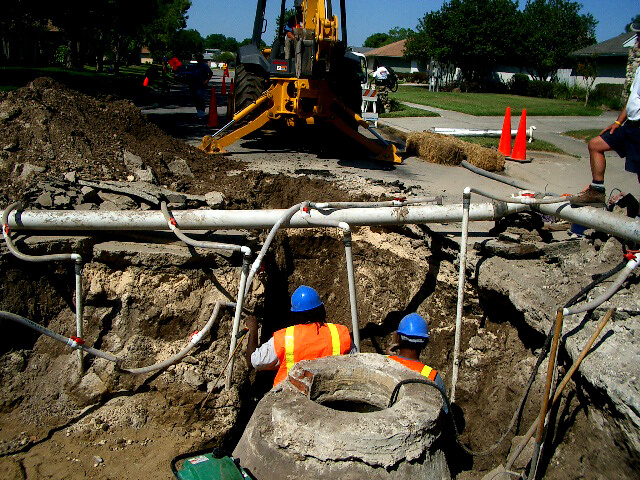 It does not require the excavation of a trench in order to reach the sewer pipes for repair. Only a small access point is dug at one end of the sewer pipeline. A technologically advanced machine, developed by Nu Flow Technologies uses the access point to push a felt tube through the existing sewer pipes. The felt tube is coated with a specially formulated wet epoxy resin. Once the resin hardens or cures in place of a more technical standpoint, the tube is removed. A pipe liner or pipe within a pipe is formed. The raw sewage and wastewater are able to properly flow through it. The new liner will not chip, crack, rust, rot or even break. In fact, it will last for well over fifty years. On average it takes a day to install from start to finish. The old excavation method can take multiple weeks to complete. Nu Drain sewer pipe lining is also approximately fifty-percent more cost effective as well. Nu Flow Technologies is extremely proud to provide our customers in Norman, OK with the highest level of service, and most technologically advanced sewer repair technology available. Our goal is to make the process as painless as possible for you.